The beautifully hand-finished cylinders gleam like a pair of imposing reactors atop MusicMachine 3’s main hull. The cylinders contain the scores of the melodies, with as many as 1,400 precision-placed pins that pluck the teeth of the comb as the cylinder revolves. Once MB&F had confirmed the melodies; it was over to Reuge to create them mechanically. A Reuge musician examined the music and identified the most recognisable passages, then set about recreating these passages for the music box. One of the biggest challenges of MusicMachine 3 was in amplifying the sound. An ingenious solution was developed by Jeanmichel Capt of JMC Lutherie, who created a bespoke soundboard featuring NomexTM – a type of honeycomb-structured Kevlar – sandwiched between two resonant 350-year-old spruce membranes. Only one in 10,000 spruce trees has the exceptional acoustic properties required. Selected trees are cut down in November when sap flow is minimal and the timber is then dried for five to ten years. On MusicMachine 3, energy is transmitted from the vibrating teeth down though the vertical side wings to the resonance base, which not only amplifies the sound, but underlines the beauty of the music. MB&F celebrated its tenth anniversary in 2015 with the tagline “A creative adult is a child who survived.” One film that children (and many adults) of all ages love is Star Wars – and who could forget the frantic swarms of the Imperial fleet's TIE fighters as they battle the Alliance. 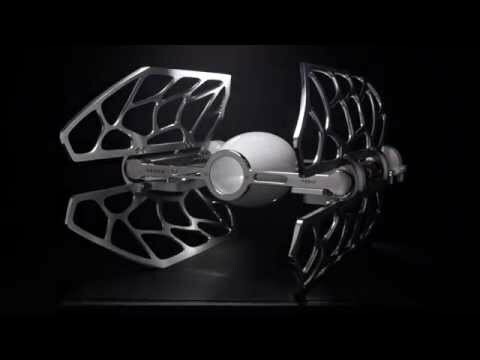 The TIE fighter-inspired MusicMachine 3 is proof positive that both the child and the Force are still going strong within MB&F. The music is powered by two independent movements mounted on the two tail sections. Each movement has its own winding key (disguised as thrusters), a mainspring barrel, horizontal cylinder with pins, and comb with hand-tuned teeth sounding each note. Air regulators in the form of circular fans (resembling rotating radar dishes) govern the unwinding speed and music tempo. MusicMachine 3 is available in three limited editions of 33 pieces each, in white, black or ‘chrome’ finish.